It was a beautiful day yesterday, but late in the evening it changed and it even rained! Well, a bit of water is good for nature, has been rather dry lately, but I am not so happy with it. For the moment it isn't raining, but temperature dropped a lot and pehaps a bit more rain will follow later today. I hope not, because we want to go out, to look around on some fairs. Our Queen and family have the " Koninginnedag"today and they are visiting the province of Zeeland. It is all on tv, so I will not ramble long, because I like to see it, especially what everyone is wearing(we have some very nice looking princesses you know!). 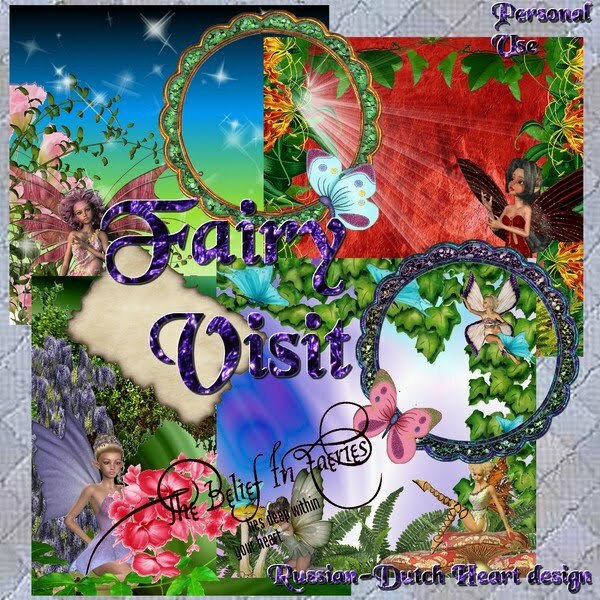 I have a smll kit for you today, named "Fairy Visit". I think the papers succeeded very well,there are 4 of them, also two frames and a little tag. And after that there still is the daily download!! This is my kind of weather! Oh my, what a lovely weather we had yesterday! I think it was about 22 C with not much wind, just beautiful. Today it might turn out still the same, as from tomorrow temperature will fall down a lot. But..... you are never sure with the wether forecasts, so just let's wait and see. If it is still rather nice weather, at least that it is not raining and perhaps a little sunshine, it still could be nice enough to take a huge walk around town and look what is happening. Because tomorrow we have our "Koninginnedag"again, so all around town there are fairs and such kind of things, which I always like to visit. So today I will do some eraands in the house to have it all ready for the weekend and we can do as we please, LOL! I was a bit creative yesterday and made another mini-kit, and that was a nice feeling. Now perhaps soon we will have our forum back completely(although it is safe now to visit again), and even we could start with some challenges again. Snowy is doing her best to get it all ready, she first will have to get together again the shop part, which was destroyed completely by the hacker. 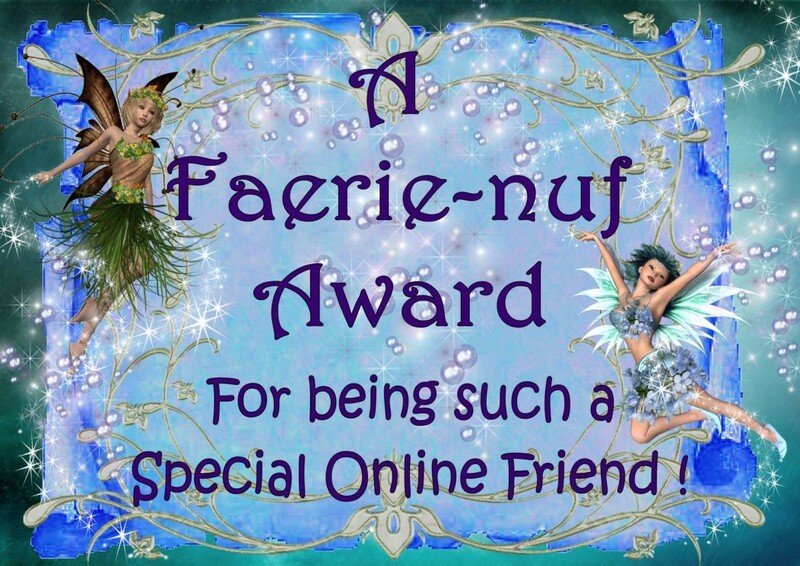 And may be the die hards of the forum can give a helping hand by perhaps getting a few challenges together and so. I don;t know if Snowy will have time to put together a slideshow for it, but I will try at least to show a preview of each daily download here on my blog, but you will have to go probably to the forum for the download. I will let you know how it will be done exatly. So on to your freebie. I made you a serie of quickpages, a bit intended as a heritage album, and also some elements to it. It grew more than I though, so I had to make 3 previews for you. The kit is named just simply "Family". Hope you can use it for something. And after that I have the daily download from the forum for you. Time for me to quit rambling, may be I do some blog hopping, have to keep up a bit with everybody LOL and may be even start with a new kit. Anyway, have a fantastic day, I surely will spent a few moments in the garden. The title is all I can tell you at the moment about the business I am involved at the moment, which needs a lawyer. We went to him yesterday afternoon, and first he will do is writing a letter. Then we'll wait what happenes. But I can say it's kind of dirty business done to me. Well, we made best of it yesterday, went to the lawyeers office walking, because it was a beautiful day yesterday and finished there we also walked back home. All together we walked for about 1 1/2 hour in a quiet pace. Today it looks as if it will be about the same kind of weather, so we better profit from it as much as possible, you never know when it suddenly changes. I can show you a few pics from my garden where some tulips are showing off! Hmmmm, suddenly Blogger is doing strange things when I want to upload a picture. It seems I cannot upload a picture anymore from my computer???? It was so easy till yesterday. For now I have to upload it somwhere else and then post the html code. Well, may be tomorrow they will have it solved. For the freebie today I have a little serie of quickpages,called "At the Farm". Hope you can use them. And there is the daily download of course. Have all a great day! Think positive, is said, but sometimes hard to do! It was quit a disturbing day yesterday! I am not talking about it here for the moment, you never know who is watching! But it isn't a nice thing that happened, needs a lawyer to take care of it. Well, I may be able to tell you later what is the matter. Then I messed up with my doctor appointment! I had all the time in mind it was on the 28th, but yesterday I looked for being sure and saw it was yesterday! WHEEEEEEEE! So I immediately called the hospital appologized to them and now I have another one on the 6th of May, it will be by telephone(as it is merely for the result of the test I had). Pfffff, solved! I don;t understand how it could happen, most of the time I am very fussy about appointments but this time it went wrong! Although I am not in best mental condition for the moment, very nervous and also pissed off, I was productive in the evening and managed to make a lovely little kit. It will be on offering one of these days. Have to show you also a new card I made for The Starchildren Project blog. Among all the turbulence of yesterday, there was also the lottery again at the cafe, so Jan went out for a moment and.................came back with prizes! First a little box, or suitcase, with make up stuff. Nice collection in it, may be I can make someone happy with it. The a great thing: a duvet of 200x200 cm.! And I just was looking for a new one for our bed! Whoopeeee! Isn't he adorable??? I am sure some day we can make a child very happy with this! LOL. 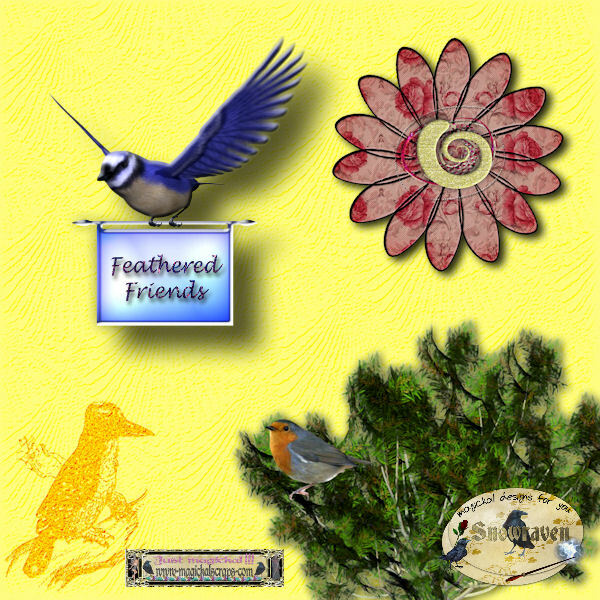 Okay, time to poast now a freebie for you and the daily download. Tomorrow I will have probably a few pics of the cleaned garden again. Must make myself a bit decent looking now, for the lawyer appointment in the afternoon, oh, it may be that the freebielist wil be at a bit later time today, but I will try to make one.! Now you all have a wonderful day, I hope at the end of today I will feel a bit more reassured! Gosh, what are we complaining about?? Oh I am glad we made the visit to heidi yesterday. We just stayed for not more than half an hour, that was more than enough. Oops, you could see she "took off a jacket"as we say here, or in other words, you can see she had a rough time the past weeks! Poor thing looks real tired, lost some weight and is having still a lot of pain from the wound. She showed us and we only saw it covered with plaster, bandage but pfffff, it's big!!!. And part of her chest and breast is still having all kind of colours of the bruise. Oh wee, it will take at least 2 or 3 months before it will be healed completely, it appears the hole is about the size of a tennisball!!! Just getting out of a chair is quite an operation for her, accompanied with pain. It's a good thing for us to witness this, it brings us back to earth on both out feet, wondering what we are complaining about. Certainly as she told us about all that happened and that only in short version! Although she will have to take much time to recover( and let's hope it will be a rather speedy one without any hurdles) I was happy to see her home again. As I planned I had bought her a few little plants for her garden, and I did plant them for her(she is in no condition to do that). The rest of the weekend we spent home, did a bit work in the garden, enjoyed the sun and our chairs in it, so it was a rather pleasant weekend. This week will be filled with some house work, some hospital visit(yak) and at the end of the week there will be our Queen day again. For your freebie there is the last part of Flowers and Fairies and of course the new daily download too. Our forum is safe to go now again, which is a good thing. We did miss it you know, so at least we can talk a bit with eachother, and get into forum business again slowly. Hopefully Snowy will find a bit of time to start the new site and then in a few weeks all will be to normal again. Now have a great day, enjoy nautre's beauty, no matter what season you are living at the moment. Just popping in for the daily download. Looks to be a marvellous day today, so we will try and visit Heidi this afternoon. 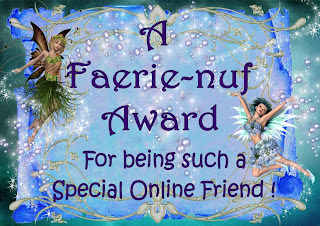 Just a quick post, the daily download and must show you my newest special award I received. Click it and you'll see more details. Isn't it a lovely one??? Now here's your day 24 download. Have an aweful nice weekend! I am planning to do some small jobs in the house, and I like to do them in the morning, so that we can enjoy the LOVELY weather for the rest of the day. And it will even get better in the weekend, the forecast said. If all comes true we will even reach around 20 degrees C here at the coast! Wow. I have no idea what we shall do in the weekend, but perhaps I will make a short visit to Heidi on Sunday, to see how she is and also because it is the 5th anniversary of their wedding day, I saw on the calendar. So I can buy a nice bouquet of flowers, but I think I will buy her a few things for the garden. She will be much happier with that. Yesterday afternoon Danny and Séverine popped in for a quick visit and a cup of coffee. You could see that the girl was kind of relieved now, that her mother was home again. ! But you always notice it with Danny too. When something like this happens, he appears to be rather cool and relaxed, but he starts talking through one's hat (in Holland we say it like this, if I would translate it words by word: he talks like a chicken without a head!!! ), rambling in a speed you cannot imagine and almost leaving no room for someone to answer. Best is to let him talk and get things of his chest this way, LOL! So I have another part of the Flower and Fairies for you as well as the daily download. You will have to come back in the weekend for the daily downloads! I better try to get started a bit early this morning, may be I first take my 2nd coffee already in the garden, it looks to be lovely weather. You have a fantastic weekend! I have good news to share. My friend Heidi is home since yesterday afternoon! I got an email from her, saying she was home again, but that she was rather exhausted and went to take some rest first. But as for now, it seems to be okay with her. Of course I instantly mailed back with a big "hoorray, you're back again! ", and letting her know I will contact her later this week, but that she first had to recover a bit from all the hectic moments! But good to know she's home again and I hope she will stay there for a loooooong time!!! I did take a bit a day off yesterday, meaning I didn;t do much around the house, just a few things and not much of designing either! Jan is in a kind of "doing-things-around the house-flow"LOL. He went again to another DIY store to buy some small things, as like stripes to keep the draft from the doors, and some kind of special cement to fill up holes in a wall and a hook for the garden door. I suppose he will attack the job today. It are minor jobs to be done, the kind you always put ahead, but I am glad they are taken care of now. and I also made this card, which you can find also on that blog, under the header: Cards and Posters, Kyra's Inspirations(isn't it nice, I have my own section there LOL). There are more cards to grab there, that I make, you better scroll a bit through the whole blog, because there are lots of things to grab, like mini-kits to make your own cards! Now here's the 4th part of Flowers and Fairies. And also the daily download, day 22! Have a great day! First I have to make a call out to a visitor! Diane, or "QueenD", could you please mail me again and give me a proper mail address, so that I can answer your question? Thanks for that! Jan stumbled on Danny yesterday, when he was looking for some DIY stuff. So the last news on Heidi is, that they operated her on Monday, to clean all the blood rests, and that perhaps she can go home later today. But if she will be home, she has to stay in bed for some days, to let it all heal, so I wonder when we have the phonecall that she is home. The poor thing isn;t having much luck lately, but let us hope she will be home soon now and that all will go well and that somewhere next week she can move around a bit(though she will do that in a very slow pace, I guess). When Jan went to look for one or two things in a DIY market, I went to my regular "supplier"of garden plants(when I am not going to a garden centre). And what a pity, there were some nice plants!!! LOL. So I took some with me as well as a big sack of garden soil, and made a few pots for the terras. I will take a few pics of them perhaps today so that I can show you. I also bought a few plants for in the flower beds, because there were some lovely aquilegia's (or columbines). I have a kind of crush for those plants, I like the foliage and the flowers of then and they grow in all sorts of colours and heights. Yesterday I bought 4 of them, they have an almost white flower with just a touch of pink. Weather still is nice here, although not too warm, it looks as "happy"weather, with the sun and also some blue sky, and in our garden it is real nice to sit, because it is rather sheltered from the wind. Time to post the 3rd part of Flowers and Fairies now along with the daily download of course. 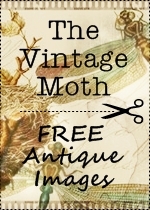 Then I must try to get some new inspiration for some freebies, I really haven't a clou at the moment.! Let's first enjoy the day, it looks to be a sunny one. You too have a wonderful day ! I have no news about Heidi yet. I didn't want to call Danny, he probably is getting a bit nuts already from the calls he has to make so I better wait a bit. Yesterday afternoon Jan and I went to the market. Jan already was there last week one day and told me the vegetables were very cheap there. So we went there and bought some of it for really just a few Euro. Part of it I already have in my freezer now, and today I will prepare the other part of it. Although the weather looked nice enough it wasn't as nice as in the week-end. And today it looks lso not too nice too me. Temperature dropped and the wind makes it feel rather cold. So ou see you will have to enjoy the days as they come and if it's real nice weather you must take advantage of it right away. Oh, at the market we saw a rather nice carpet for the floor in the sitting area of our room. And for a very nice price too. We are thinking about it now, and have taken the measurement of the maximum size we could have. Probably the quality will not be super, but we do need a new one and for that price it looked real nice. So may be we will go back to the market this week and buy one. Oh, I will be so happy if a new carpet will be there! 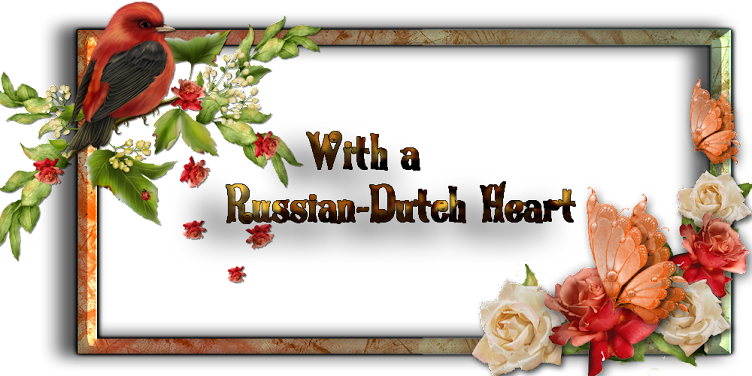 That's about all there is to tell so we better hurry up and post the next part of the freebie, Flowers and Fairies and also a new daily download. You all take care of yourself and I hope you will have a great day! We had a beautiful Sunday this weekend!! In our garden it was real pleasant to sit and even warm in the sun already! It really gave the impression spring is in town LOL. Now for the next couple of days temperature will be a bit lower, but they expect that towards the weekend it will go up again . We'll see about that. I have some news about Heidi, which isnt yet all too good. I had her on the phone Friday and the wound was still leaking too much blood. She was kept under pression by wieght on her chest all weekend and she had to stay flat in her bed. Today the surgeon will look if the vain healed itself during the past days. If not, they will operate on her again and remove all the blood rests and try to close the vain. It only needs a tiny little hole to cause this trouble, but they hope the body will do the trick for her. If they'll operate, she will have to stay a bit longer there. I think at least also tomorrow. If they will be able to close the vain, she will have to take a shower tomorrow, put her clothes on, do some very light exercises, to see if the vain will hold. I the answer is yes, she might be home tomorrow evening or Wednesday. Let us just hope operation will not be necessary. A good part is that the new Port-a Cath is behaving itself well and she has no trouble with that. So today I have to go to her house to have a walk with the doggie, because Danny had to go to work. Oh, no change of plans! I just had a call from him, and he had a call from his boss, that he should take it easy and stay home this week. Isn't that a wonderful boss????? So no doggie walk today, and I will get a call from him if he knows anything more. He even offered that I should ride along with him to Amsterdam, but I don't do that. What good will that do, if there are sitting 3 or 4 people, it only wil make Heidi more nervous I suppose. I'll better be standing by when she is home again, I might be of better help. During the weekend I was rather creative I can say. 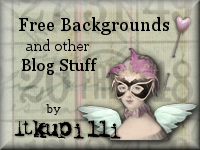 I made a few things for the Starchildren project blog and also some new freebies for this blog. So let's show what there is hey? Here a mini kit I made for the project, 4 quickpages and 4 backs. The link for the download will be soon on Minky's blogs! for the beautiful frames I used for the pages. The last thing to do is giving you the daily download of Magickal Scraps, day 19. So you all enjoy your day and hopefully the bragbookpages too! Sorry, but I don;t have much news to tell you. It was just a normal day yesterday, with rather fine weather. So this will be a bit dull post.! I will try to contact Heidi today, to hear how she is doing. Truly hope she is okay again and may be she comes home. Well, I am just posting while I have a kit for you and of course the daily download link. The kit is for Mother's day, which is also the name of the kit. Hope you will like this one and I wish you all a terrific weekend! I'll be there in the weekend too, just to post the daily downloads of Magickal Scraps. We have a much bigger garden now! Oh whee, we had a good clean up of the garden yesterday afternoon.! Especially at the back part of it. There still it was a real mess after the working guys went through it with their big feet, and all we had no place for was put there and stayed there and the pile only grew as we were cleaning up the bushes, for all the ivy! So yesterday Jan started with it and I helped him, to bind the pruning stuff together(3 piles!) and getting all that was old, dirty, not needed, broken(like a LOT of pots etc.) into garbage sacks, all together 7! and the open space was swept clean with the new broom, etc. I think it took us about 1 1/2 hour tough working but now we have a bit our garden back! Here the terras at the back of our living room, which still needs more pots and plants, but at least the beginning is there and it's looking now already much friendlier! We still need to do much more work in there, like painting, re-doing some of the paving, etc., but I am happy with this already! At least you can move around there again!!! I have a link for you today from another blog of Minky, the very very busy lady!!! It could be an inspiring blog to read, and healthy too. That's all I am going to say about it, best is you go there and see for yourself and it will totally up to you what to think and/or do with it. Your freebie for today is totally a Spring one, named it "Spring Makes you Happy". Hope you ca do something with it. And of course I have the next day for the daily download of Magickal scraps.!! Now have a great day! Thank God I had a telephone call from Danny(Heidi's husband) yesterday evening. She was operated yesterday, to remove the blood parts out of her chest and to see if the vain closed itself and they also placed the new Port-a-Cath, this new one one the other side(left side of her) in the neck. It's connected too, so that should hopefully work okay with her medicine and she now should have only one infuse in her arm. It might be that there still are some little blood remains in her chest, could be they have to remove them again, but I don;t know that yet. For the moment she seems to be allright, although she still has pain, because of the operations, of course and the infection that was there too. And I can imagine she is totally exhausted by it all. I gather they will keep her for a few more days at the hospital(which is better for her), may be if all goes as it should, she will be released Friday. I think I will hear that later from Danny, of may be even herself. I don;t want to bother them with too many phonecalls, if anything is happening I will be informed by Danny. I so hope it will be over soon for her and that she can go home and recover a bit from this all. Yesterday afternoon, after I returned from the shopping, Jan prepared himself to go out for a walk. As it was rather nice weather I joined him. We had a nice walk for about 2 1/2 hours, saw a lot of nice little shops(and didn't buy anything, wow), so it was a nice afternoon and we came home at about 5. I made a quick dinner, of Chinese wok noodles, sate(just had to warm that up in a pan) and mixed salad. It tasted good, yummie. And on to your freebie. I am very much in the making of quickpages and bragbook pages at the moment. It is a period I am in now LOL, soon enough I will make kits too again(I still have a couple waiting to be posted), but okay now I have a serie of a kind of quickpages concerning recipes, along with some backpapers and some elements and a template of the recipe and a wood sign, in greyscale, so you can use them over and over again. I hope it will be something you can use. I named the whole "kit""Special Recipe". And as last thing I have day 14 for you from the daily download. Now you enjoy your day, make something nice out of it! Well, I 8did my tests yesterday, about the results we hear on the 28th of April. For the moment I am "hospital-free"", hoorray. I am lot more concerned about Heidi. I called her yesterday and when I asked her how she was she answered: not too goo". Normally she always says, oh I am okay, even when she isn;t feeling too well. So what happened. On friday they operated her to remove the old Port-a-Cath. In the evening she was leaking blood from that wound. To keep it short, the vain where the Port-a-Cath was connected in, was damaged and was leaking. By injecting a special fluid they hoped to stop it and let the vain heal. Didn't work too well it seems, Saturday night finally the surgeon came to see what was the matter. Then they tried first by placing weight on the chest to let it stop. This morning I just had her husband Danny on the phone,who was in the hospital and he told me she was in the operating room. They will try to close the vain, and also place the new Port-a-Cath on the other side. It will not be in her chest but in her neck. It's not so big, about the size of a doorbel, Danny told me. That's about all I know now. Let's hope this all will work out and be done with, the poor girl isn;t in much luck lately. I can imagine it is a stressful time for the whole family. I am feeling so bad because of her, but there is nothing we can do so we must go on doing our daily things and hope all will end well and will be done with within a few days. Let's get her home first in reasonable shape/condition and then she will have to recover and take it real easy for a bit of time. Not the happiest news to tell, is it? Good thing I must do some serious grocerie shopping today, that will take my mind off a bit, I hope. I have a freebie for you today, it's the colour challenge for March I made for the forum, named "Sunny Spring morning". And of course the next Daily Download for April. Please send a little prayer up for my friend Heidi, I am sure it will help if we do it all together. Thanks. Now you all have a lovely day! Just popping in and out. I am really jus tpopping in and out today, because I have to go to hospital for another test. 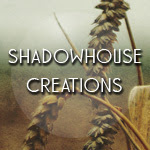 So I just have time for a few words and posting your freebie + daily download of Magickal scraps. Seems the magickal Scraps site is safe again. I wasn't there yet, just had the mail; of Snowy. So here I have a very small kit, in real soft colour, on the preview you don;t see really the details of the paper. I named it Soft and Sweet. Just quickly popping in to give you the daily download. Then I am gone again, to make the most of today, tomorrow afternoon hospital day again, yak.! Tell you more tomorrow. He, it's me, on Saturday! Just a real quick post, I have for you the message, that the link for Fairytales nr.4 is corrected. Should be working ok now and must give the two pages. Then I have the new daily download from the forum for you, with a preview! Thanks to kind Edna, who zipped them all up and sent the link to me.! And because I am such a nice person LOL LOL, I will give you the last part of Fairytales, so you will have them complete this weekend. Hope this one will work as it should be.